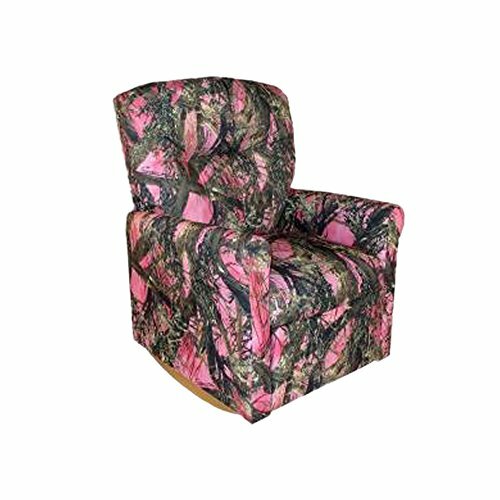 This Contemporary Pink Camouflage Child Rocker Recliner Chair in True Timber Fabric will make a statement in any living room. This recliner is perfectly suited for the perfect child. Our high-quality recliner comes in kid-durable Pink Camouflage Denim which makes cleaning up crumbled cookie crumbs a snap. Don't conceal your love from that special child. Bring home the Pink Camouflage Rocker Recliner today. Add a little rock to your little one's favorite afternoon show. Exclusive safety design keeps rocker from rocking or tipping over while in the reclined position.